Home / Adviart Blog / Don’t ever change. Don’t ever change. This adviarter picked a rock because of its weight. A rock is solid. 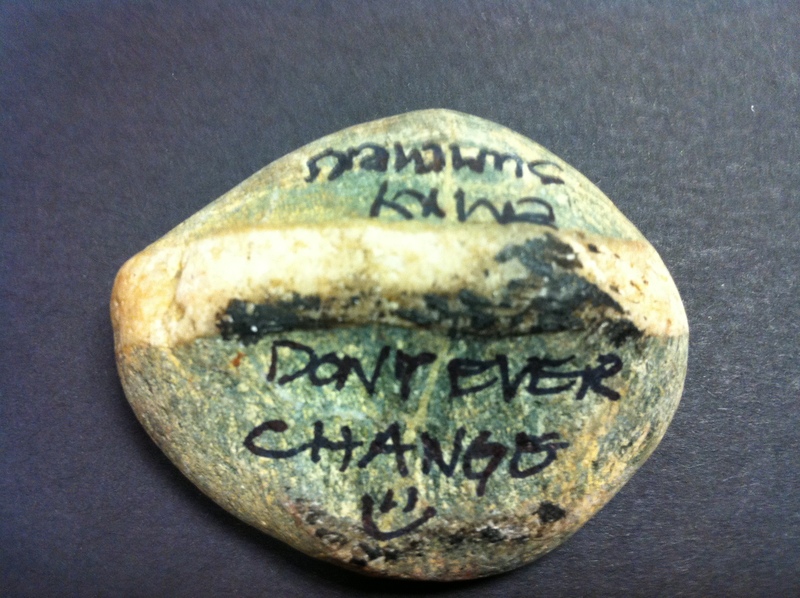 The adviarter wrote her advice across the rock. The words are balanced across the surface of the rock. A smiley face is noted after the advice. Black was used because it is a simplistic color. Bold letters were used because of the bold advice. There is symmetry to this rock. Thinking about change overall is a hard thing to do. I feel as if we always have to change in the moment given troubles and opportunities that come our way. When I think about this advice though, I put it into the perspective that I shouldn’t change my core. The inner being doesn’t have to change with the outside–in some ways not changing makes us more stable (assuming we have done the work to fully explore who we are and to know what we truly value). How can we ensure that we find ourselves–become confident and comfortable with who we are–and then not change when faced with adversity or opportunity? When is it right to change? How can we ensure that we are working to a solid structure in ourselves?